Cut Chicken into serving size pieces; wash, remove any pin feathers and dry. Place the Chicken in a baking dish and pour the Buttermilk over it; refrigerate for 30 – 60 minutes. Place the Flour, Salt, Pepper, Paprika and Cayennein a large paper bag; add a few pieces of Chicken at a time and shake gently so that each piece of Chicken is covered with the Flour mixture. Heat Oil in a deep fryer; the Oil should be deep enough to completely cover each piece of Chicken. 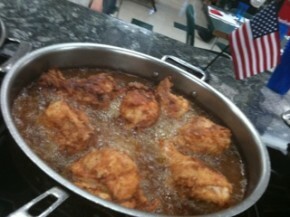 Heat about ½” of Oil in a large skillet or sauté pan; quickly brown each piece of Chicken (use high heat). Transfer to a platter until all the pieces are browned. 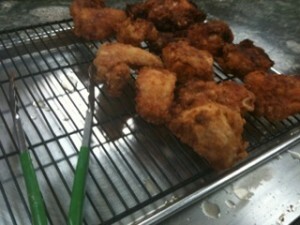 Return all the Chicken to the pan; add 1 cup of Water or enough to come up at least half an inch. Remove the lid and let the Chicken fry slowly until crisp or place on a baking pan and put in a 350 degree oven for 10-15 minutes. Drain on a cooling rack set over a baking pan to remove excess oil.